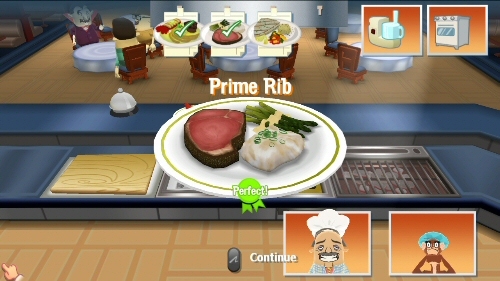 GAMER'S INTUITION - Game reviews - Order Up!! Order Up! 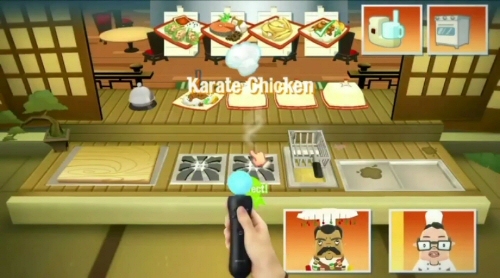 launched on the Nintendo Wii a few years ago, but the game has been given new life via a recent release on the iTunes App Store by Chillingo, and now a port to the PlayStation 3 by Ignition. In Order Up!! 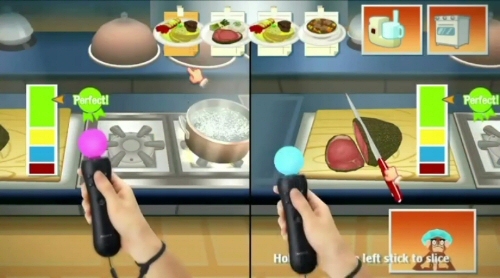 on PS3, you'll be able to use either the Move wand or your standard controller to create dishes in level based time management play. You'll work your way up the culinary ladder, from humble beginnings as a fry cook at a burger joint to serving dishes at the classiest restaurants in all of Port Abello, but you'll run into quite a few roadblocks along the way. In each level, you'll be tasked with serving patrons a wide variety of dishes, from pancakes and eggs to fried chicken and chili. 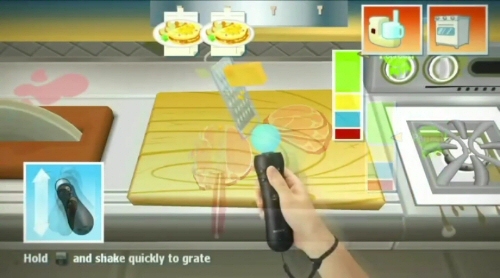 The PS3 Move motion controller will allow you to have a more realistic time in the kitchen, as you must flip burgers or eggs by actually rotating the wand in your hand, while chopping onions or peeling lettuce is (in theory) as simple as shaking the wand up and down or moving the wand from left to right, respectively. 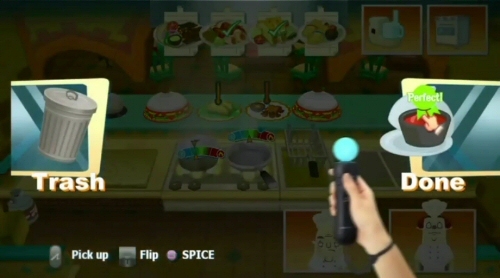 However, many of these actions require far too much force from you to actually make the game respond, regardless of how close you're sitting to the PlayStation Eye camera, or how accurately you're pointing the wand at the Eye. This leads to wrist strain within just a few levels, and unnecessary frustration that isn't found when simply playing with the standard controller. With coins and tips being earned for each dish served, you'll be able to purchase additional options for your menu, spices to kick dishes up a notch (based on individual customer requests) and can even hire sous chefs to help you in the kitchen. 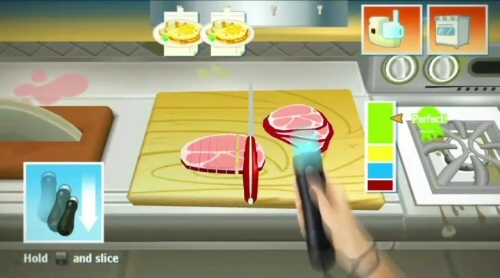 Thankfully, these helpers will take care of any task you throw their way, allowing you to multitask on two or more dishes at once (and therefore earn more money in each level), or simply save your wrists from the more straining actions (like carving meat, which requires a lengthy sawing motion). It's unfortunate that Order Up!! 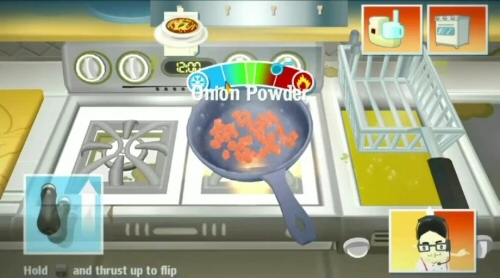 's Cooking Mama-style ingredient preparation is so tedious, as there is some genuine humor found in the dialog and character models, which are intentionally skewed to fit random stereotypes (a ship captain with a duck on his head, a hefty man in workout gear who has come to eat back all of those burned calories, and so on). 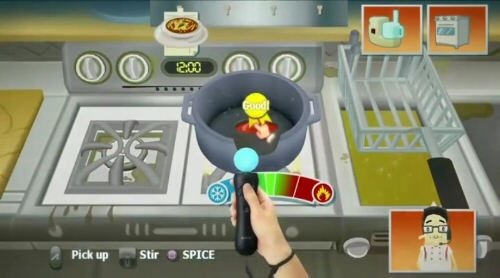 The sous chef mechanic helps you complete levels far more quickly than doing so on your own, and therefore increases the fun, but when they quickly fall asleep due to being overworked, you're left to waste more time in waking them up. 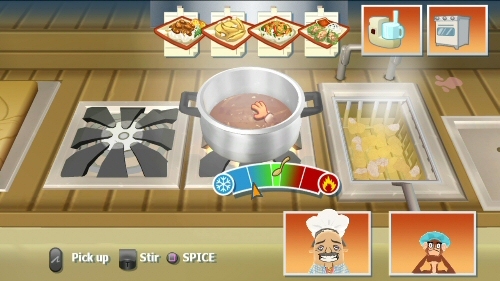 Furthermore, some of the game's user-interface could use some work, with the ability to add spices being easily forgotten, as the spicing ability may only be available at one particular stage of one individual ingredient's preparation and nowhere else, and the simple fact that a customer wants a spice is hidden in the corner of their order ticket. Add all of this to all-around atrocious loading times and you have a game that works against itself in the fun department. If you're interested in Order Up!! on PS3, know that this isn't a perfect experience, but it does offer a certain level of charm to make up for its many shortcomings. For $30, I would have expected more from the game's Move motion controller recognition, but playing with a standard controller eliminates most of the frustration therein. Ultimately, Order Up!! is a dish best served to those who don't mind long loading times, and aren't expecting a lot of depth from their meal. Special thanks to Ellen Manuszak and Ignition for providing a copy of this title.